KFAR CHABAD, Israel (CNN) -- Thousands of mourners and emissaries from the ultra-Orthodox Jewish Chabad movement poured into an Israeli village Tuesday for the funerals of two people killed in the Mumbai terrorist attacks. 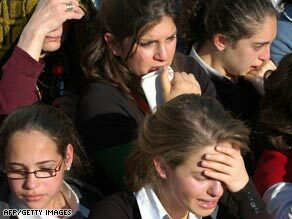 Israeli girls mourn Rabbi Gavriel Holtzberg and his wife Rivkah, who were killed in the Mumbai attacks. There was a feeling of pain and anger at the funeral in Kfar Chabad, a village of 900 families just outside Tel Aviv. Speeches at the funeral said the gunmen sought out the Chabad House in Mumbai and targeted the victims because of their faith. The two people laid to rest Tuesday were Chabad House directors Rabbi Gavriel Holtzberg and his wife, Rivka. They lived and worked at the house in Mumbai, which served as both a home and Jewish center -- a place open to anyone who wanted a place to pray, eat kosher food, or celebrate Jewish holidays. After the funeral, the bodies of the Holtzbergs were buried on the Mount of Olives in Jerusalem. Another victim from Chabad House, kosher supervisor Rabbi Leibish Teitelbaum of New York, was buried there earlier. Separate funerals were held for Teitelbaum and another kosher supervisor at Chabad House, American-Israeli Rabbi Bentzion Kruman. They died in the siege along with Israeli grandmother Yocheved Orpaz and Mexican citizen Norma Shvarzblat Rabinovich. The building, also known as the Nariman House, was the local headquarters of the Chabad community, a Hasidic Jewish movement. The couple's other son was not in Mumbai at the time, according to Rabbi Yehuda Krinsky, chairman of the educational and social services arms of the Chabad-Lubavitch movement. The child has Tay-Sachs, a terminal genetic disease, The Associated Press reports. In an emotional scene before flying from India to Israel on Monday, the boy repeatedly cried for his mother at a memorial ceremony at a Mumbai synagogue. Commentary: Were Mumbai attacks inspired by al Qaeda? His cries were played repeatedly on Israeli TV stations. "You don't have a mother who will hug you and kiss you," Rabbi Kotlarsky said, adding that the community would take care of the boy, AP said. "You are the child of all of Israel." The only other surviving member of the family, Moshe's brother, has Tay-Sachs, a terminal genetic disease, and is institutionalized in Israel, AP added. The Holtzbergs' eldest son died of the disease. The Holtzbergs went to Mumbai five years ago to serve the city's small Jewish community and the thousands of Israeli visitors and business people who frequent the area, according to Chabad.org, the ultra-Orthodox group's Web site. Gavriel Holtzberg, 29, was born in Israel and moved to Brooklyn, New York, when he was 9. He studied in New York and Argentina and traveled to Thailand and China as a rabbinical student. His wife, Rivka, 28, was a native of Israel. In Mumbai, they ran the headquarters of the Chabad community, a Hasidic Jewish movement. The center, in a building known as the Nariman House, was open to anyone who wanted a place to pray, eat kosher food or celebrate Jewish holidays. In footage filmed two years ago by the Chabad movement, Gavriel Holtzberg said anybody who visited the center was welcome. His wife said its doors were always open and that it was not unusual to have 30 people for dinner. Kruman was in India to help Teitelbaum supervise a mushroom packing plant under kosher certification, the Chabad Web site said. He grew up in Israel and in the past year had visited China once a month to supervise food packaging plants there. Kruman often visited the Chabad House in Beijing, the organization said, and survived the May earthquake in China's Sichuan Province. He leaves behind a widow and three children.